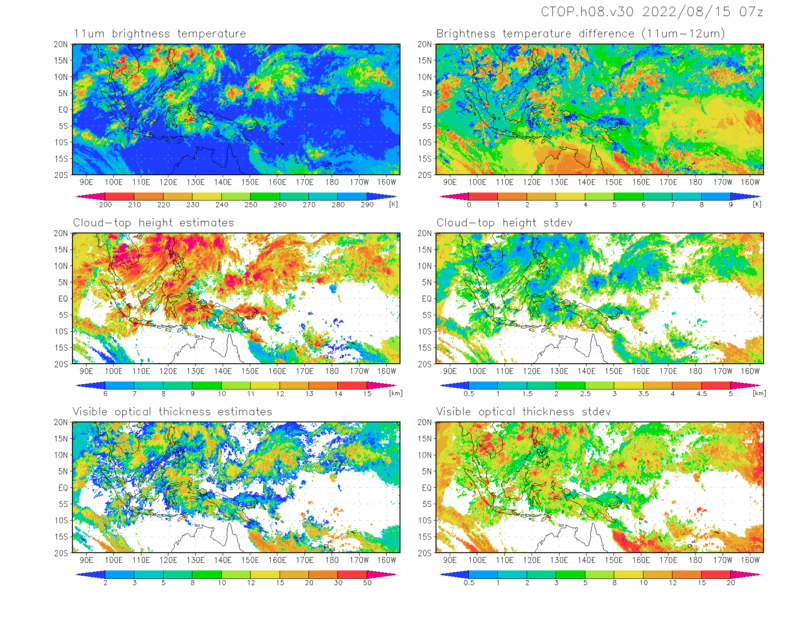 Download site of product of cloud top height and optical thickness estimated by geostationary satellite measurements. By using 2-dimensional look-up tables as a function of geostationary satellite split-window measurements (at ∼11 and ∼12μm) made through comparison with CloudSat radar echo top height, cloud-top heights and visible optical thickness are estimated "experimentally." Standard deviations of samples are offered with the estimated values in order to show precision of the estimation. Please refer to Hamada and Nishi (2010, J. Appl. Meteor. Climatol.) for details. Use of this product is limited for noncommercial purposes. The products since 07Jul2015 are made from Himawari-8 data but with lookup tables for MTSAT-2 (not for Himawari-8). Therefore, they probably have some biases in the estimates. We are now preparing official look-up tables and products for Himwari-8. Value of 88 [km] is stored for estimate and standard deviation in the case that there must be dense cloud but the estimate could not obtained. Since spatial coverages generally vary by satellite, please be careful when you use data from more than two satellites at the same time. MTSAT-1R, MTSAT-2, and Himawari-8 data are provided by the Center for Environmental Remote Sensing (CEReS), Chiba University. Any questions, corrections, and suggestions are welcome and can be emailed to the person in charge at .